Both creek and settlement were named for the Ioni Indians that camped here. Evidence provided by tools and arrowheads. The town peaked with a population of 60 in 1884. Although it had a school, three churches and a store as will as a gristmill and gin, by 1896 it only had 25 residents. The town faded away in the early years of the 20th Century and today there is little left. It stopped appearing on maps in the 1920s. 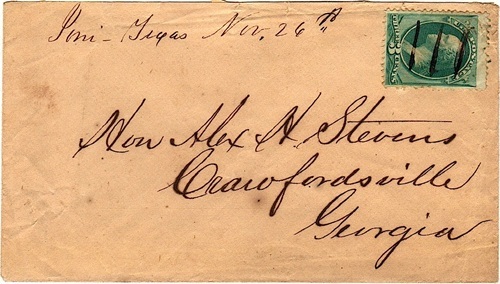 Proof of its existence appears here in the form of a post mark from the John Germann collection.